Listening is an essential life skill that helps children achieve success at school, follow safety rules and show others that they care about them. In a world filled with distractions, being a "good listener" has become more difficult than ever. The playful rhymes of Yes, I Can Listen! encourage children to appreciate the rewards of attentive listening. 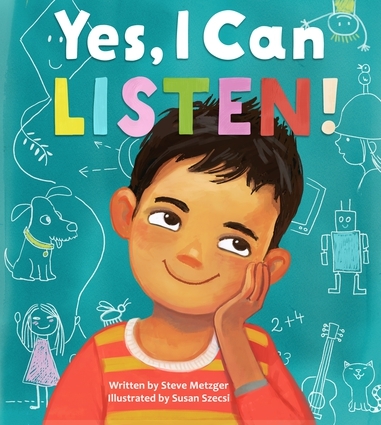 With sweet characters, varied type faces, and vivid colors, this picture book introduces a variety of listening scenarios. Each two-page spread let children imagine how they might listen in a number of common situations. Yes, I Can Listen! concludes with a page of suggestions for parents who wish to explore more activities that encourage and develop their children's listening skills. Steve Metzger is the award-winning author of more than seventy children's books, including The Way I Act (approved for classroom use by the California Department of Education), Detective Blue (IRA-CBC Children's Choice List), and Pluto Visits Earth! (ABC Best Books for Children). He lives in New York City with his wife and daughter. For more information: www.stevemetzgerbooks.com.Susan Szecsi is a freelance designer and illustrator with traditional fine art training.